Paige McKenzie is the young star of the hit YouTube channel The Haunting of Sunshine Girl. What began as a simple “girl and her haunted house” story has grown to a multi-webisode network with stories of zombies, ghosts, Sasquatch and lots of Sunshine! Full of positivity, humor and plenty of scares, The Haunting of Sunshine Girl is a cross between Buffy and Veronica Mars, and has allowed Paige to spread her unique brand of positive Sunshine to other teens (and many adults) all over the world! At the age of 16, Paige (along with her mother, actress Mercedes Rose and producing partner, Nick Hagen) co-founded the production company Coat Tale Productions. 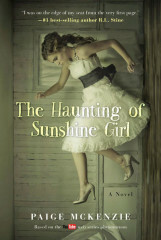 The Weinstein Company recently optioned The Haunting of Sunshine Girl for a multi-book and television show. Paige lives in Portland, Oregon.